I have seen this question being asked frequently on here. A lot of students have a bit of an issue in understanding why, if an electron is placed in a field with potential V, that the energy gain after going through the field is always eV, no matter how far away it has to move. For example, in a parallel plate capacitor situation where the potential across the capacitor is V, an electron that starts at one plate will gain an energy eV when it reaches the other plate, no matter how far away the two plates are separated (ignoring edge effects). Certainly, when I first came across this as a student, it was a bit puzzling, but I remember working it out on my own and convincing myself this is correct. So I will show why this is so, both qualitatively and quantitatively. We will do this qualitatively by applying an analogous situation. 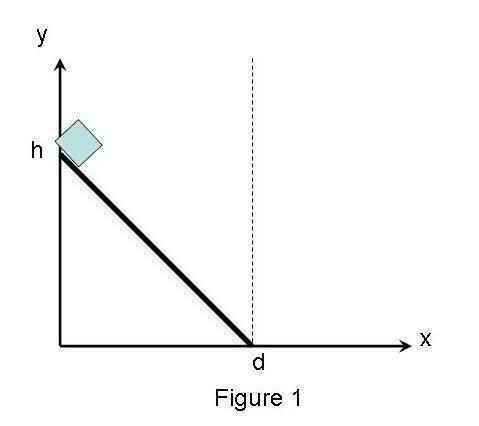 Say that you have a mass at a height h, and it rolls down an inclined plane to a horizontal distance of x=d (see Figure 1). Now, how much kinetic energy has it gained? You’ll notice that the height h provides the change in gravitational potential energy, mgh. When the object goes from high h to height 0, it would have lost mgh amount of potential energy, which is converted into kinetic energy. So the gain in kinetic energy is exactly mgh. I can vary x to any length that I want, and it would not change the amount of kinetic energy that it gains. This is identical to the parallel plate capacitor problem. So now, let’s prove this quantitatively. The scenario is sketched in Figure 2. An electron of mass m starts at one plate, and we want to find how much energy it has gained when it reaches the other plate. The final velocity does not depend on d, the distance between the two plates! This means that the kinetic energy gain is also independent of d! You can also do this derivation using work-energy theorem and get the same result. Maybe this is a good exercise for you to do on your own to convince yourself. So why is this? 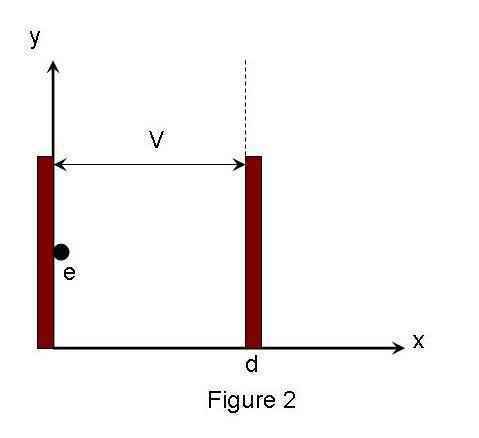 Note the the magnitude of E depends on d. For a constant V, the closer the two plates are together, the larger the magnitude of E. So even though the electrons only has a short distance to travel, the force pushing it to move is LARGE. If the separation between the two plates is large, the electron may be pushed for a longer distance, but the force acting on it is smaller. In the end, the effects balance out and the gain in energy remains the same. You can apply the same mathematics for the ball-inclined plane problem above. this only makes part scene to me, i a sophomore attending Parker high and in freshmen year we only touched up on this sort of problem. sorry to ask but could you explain a little bit further. im trying to learn a lot about upcoming subjects in science. What part of it does not make sense to you?